It was on Thursday (September 21) that Marion "Suge" Knight pleaded no contest to voluntary manslaughter in a Los Angeles courtroom. The plea deal is for Knight to serve 28 years behind bars in a state prison. 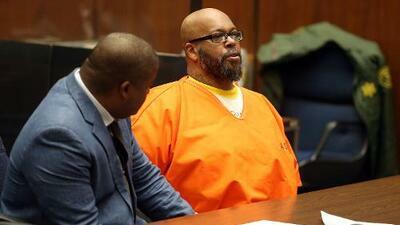 The deal ends the 53-year-old, Death Row records C.E.O. case over the involvement of the 2015 hit-and-run murder case of 55-year-old Terry Carter. Knight had spent three years in prison and will get credit for the time served and will be on parole for three years after being released according to the L.A. Coutny District Attorney's office. Knight is behind bars all due to an altercation that happened outside of Tam's Burger joint in Compton, CA. The event occured when Knight was behind the wheel of a Ford truck to run over two men he had a disagreement with. Carter was killed and the other man known as Cle "Bone" Sloan was injured. Knight sped off after but had turned himself in and was immediately arrested. Courts calculated Knights prison sentence with a high-term of 11 years that was doubled due to the state's three strikes law, an additional five years because of the "serious and violent felony" and a year for using the truck as a deadly weapon. With the plea deal made, the other cases against Knight that included making criminal threats to an entrepreneur in August of 2014 and stealing a camera from a woman in September 2014 in which those charges were dismissed. The daughter, Crystal Carter, of the slain dad that Knight murdered ran out of the L.A. courtroom when the plea deal was agreed. She told the media: "It will never be a win to the family. Can't bring my dad back."